All month we've been sharing session tips and tricks from the stars. Today we bring you five burning studio questions, from the frustration of artist collaboration to how well-schooled you need to be to make it as a session player. Are you ever frustrated by a lack of freedom in the studio? Dean Butterworth: "Sometimes the artist and producer have a set idea of what they want me to play and I have to stay to that format and other times I have the freedom to do what I feel would be good for the song or a hybrid of the two. Either way it's not about me, it's about getting the best drum track for the song." Have you ever been asked to play something that you didn't think was the right part? Neal Wilkinson: "… especially in the '80s it seemed that a lot of people wanted very busy drums and lots of fills, almost over-the-top fills. I'd play something very simple and they'd be like, 'But that's boring'. Those are the ones that spring to mind, of people wanting me to play more and me feeling very uncomfortable doing it. 'More fills on the choruses. Just go mad!' I hate being told that because I don't naturally feel that. I don't want to do that. 'No, no, do huge drum fills! Go mad! Make it a feature!' Yeah, but it's a song. Those the times you think, these guys are paying me to be here so you've got to do it." How important is it to be able to play a wide variety of styles? Ian Thomas: "I learnt to read so I could play in dance bands and play in big bands. It was so I could be a rounded player. All the different styles I play are not because I was trying to do it as a session musician but because I love to play jazz. I also love to play groove stuff, I've always loved pop music and r'n'b, that's why I play them. The other day Scott Walker said to me, 'Do you know a band called Slipknot?' The only reason I know Slipknot is because my nephew is mad for them and every time I go to Wales he plays me Slipknot. Scott played me some stuff and the sort of thing he wanted was the thunderous drum solo thing, so I was lucky enough that I could pull it off. All the things that happen in my playing career are referenced and used in the studio. I was doing a film and there was nothing written on my form apart from the bars and it said it was in 3/4. I said to the writer, George Fenton, 'What sort of thing is this George?' and he said, 'It's a valeta,' which is a type of ballroom dance which I learnt when I was boy playing the social clubs in South Wales at the age of fourteen. All of that stuff goes into the melting pot." How much theory and drum history knowledge is needed for session players? Swiss Chris: "It is a must to know the drum history and their cultural Drum Rhythms from West Africa, to the West Indies, to New Orleans, East and West Coast back to North Africa, England and Europe as a wholeor be able to play at least the funky version of the original rhythm. Also know your rudiments and apply them on the kit." How important is an ability to quickly adapt to the style the artist wants? Robin Guy: "Very. I did this tour with Martin Barre (Jethro Tull guitarist) & on the way to the first rehearsal, I called the bass player and asked what he was like to which he replied, 'He hates volume'. We had to rehearse at a level where we could talk and be heard whilst playing! I did the entire tour with one set of hot rods. After the last show, Martin came up to me and said, 'I'm very proud of you Robin'. Needless to say, that made my day." 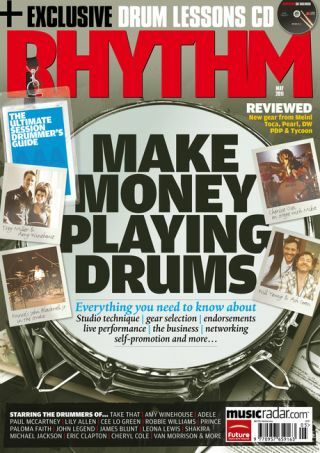 For more session hints, tips and secrets pick up the latest issue of Rhythm and check out our online Session Month.